Cassava is a very important staple in Africa and even an industrial crop now. This condition makes cassava planting materials (cassava sticks) production another important aspect of cassava cultivation. 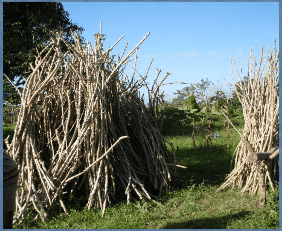 Farmers may lose their cassava stems to destruction by fire or diseases and pests and even to bad weather conditions. Farmers may also desire specific variety that is not available in sufficient quantities. These are just a few of the ways cassava stems may be into shortages. What do farmers do in the situation of cassava stems shortages? This outline of steps will help farmers reproduce cassava stems (planting materials) in any case of shortages. It also eliminates the incidence of cassava diseases spread through the planting materials. This helps to avoid the spread of cassava diseases. Farmers are sure to produce planting materials that are free of cassava diseases. 2. Cut cassava stem into smaller parts using sharp objects like saw, secateurs or cutlass. Blunt edges damage the stems exposing it to infections. Cut semi-mature portion on stem into mini-stems with 4-6 nodes. Cut hardwood portion of the stem into ministem with 2 nodes. Sprouting can be done in a nursery box or in loose soils on the ground with adequate moisture. Within the first 10 weeks after transplanting, control weeds efficiently and manually in order to produce healthy and strong plants. Cassava stem is matured to harvest from the 6th month. Cut the stem at a height of about 30cm from the ground and leave the stamp to develop shoots again. This is called “ratooning“. Several shoots will sprout from the stamp. Leave between 3 and 4 shoots to maintain a healthy and strong plant. 7. Store stems upright under shades. Store cassava sticks for up to 8 weeks. These sticks must be placed upright with bud pointing up in a well-ventilated area.